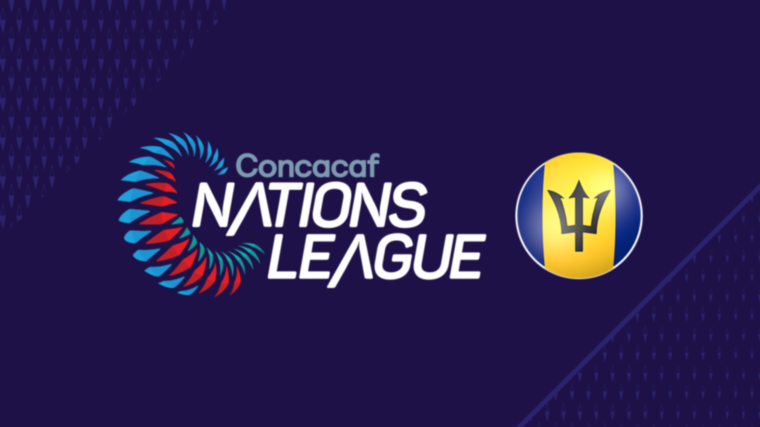 A late goal in the 78th minute from Neil Danns brought the Guyana Golden Jaguars back into the game to see them take an at-home draw when the Bajan Tridents paid them a visit on Thursday night the teams' first game in the Concacaf Nation League Qualifiers. After coming from behind to take the lead in the second half, the Barbados senior men allowed the English pro just enough room to level the scales to see the score to two goals apiece at the Leonora Track and Field Centre. With the Guyana/Barbados game being the second of the tournament, the pressure was on for goals as earlier in the day, Dominica and Suriname played to a goalless draw. And the match-up would not disappoint as both sides had several bites at the cherry. The hosts had the first shot on target in the 22nd minute with a ball coming in from the left to the middle to find the head of Danns but was calmly collected by Bajan custodian Keasel Broome. Ten minutes later, Guyana was on the attack again but made a meal of the chance as Sheldon Holder had a clear bar with Brome off his line as he advanced to make the save. However, Holder put the shot too high and it went harmlessly over the crossbar. Guyana kept the pressure on the Tridents who were still feeling out their opponents but were able to thwart a couple other opportunities to go into the break at 0-0. Whatever the conversation was in the dressing room at half-time, it paid dividends as 18 seconds into the second half, Guyana got the first goal of the competition from the boot of Trayon Bobb. Despite being one of the shorter players on the field, the quick left-winger who plays in Portugal these days was fed a beauty of a through-ball form the middle and easily ran to collect and finish with his first touch. Guyana made note of the lapse on the left flank and continued their attack on that wing. In the 56th minute a poor attempt at a clearance landed at the feet of an unmarked Daniel Wilson just outside the box and he took a big right boot to the ball. However, Broome was alert and swift on his feet to make a diving save to his right and parry the ball over the line for a corner. Barbados got themselves into the game in the 64th minute as Hallam Hope made his debut for Barbados with a brace. Bobb repaid Barbados for his earlier goal when a stray clearance from him went straight to Hope who ran in from the left to swing his right boot on his first touch. The ball soared past two defenders and a diving Kai McKenzie-Lyle. Hope would strike a second time in the 73rd to finish up a clever play by the Tridents. Barbados captain Rashad Jules was moving up the left flank and pushed the ball to Zeco Edmee in the middle of the box. Edmee was deft in his touch back out to Jules who pushed the ball the rest of the way before sending it across the goal mouth to a diving Hope. Danns ensured that the home team could hold their heads up when he finished the game with his equaliser.Getting a good pass from the middle out on the left, Danns was given just enough room to set himself up and take a shot from outside the box that beat Broome to his left. Both teams have their second matches in October. Guyana will travel to Turks and Caicos on October 13th while Barbados go to El Salvador on the same day.